» Bose Cinemate 15 Review – Worth Reading For A Good Deal! In general, no matter how good your TV is, it cannot fulfill all your wishes, especially when it comes to the sound quality and functionality. There is an inherent feature of the sound system of almost every conventional TV that may dissatisfy the owner very much – The sound is not clear and vivid enough for some kinds of “cinema experience” at home. Bose Cinemate 15 is one of the great choices. Although you may think that you have a quite certain picture of this loudspeaker from the rough introduction on buying websites, you still don’t have enough information, especially practical pieces about this deal. Go over my thorough Bose Cinemate 15 review to reinforce the idea about it right now! 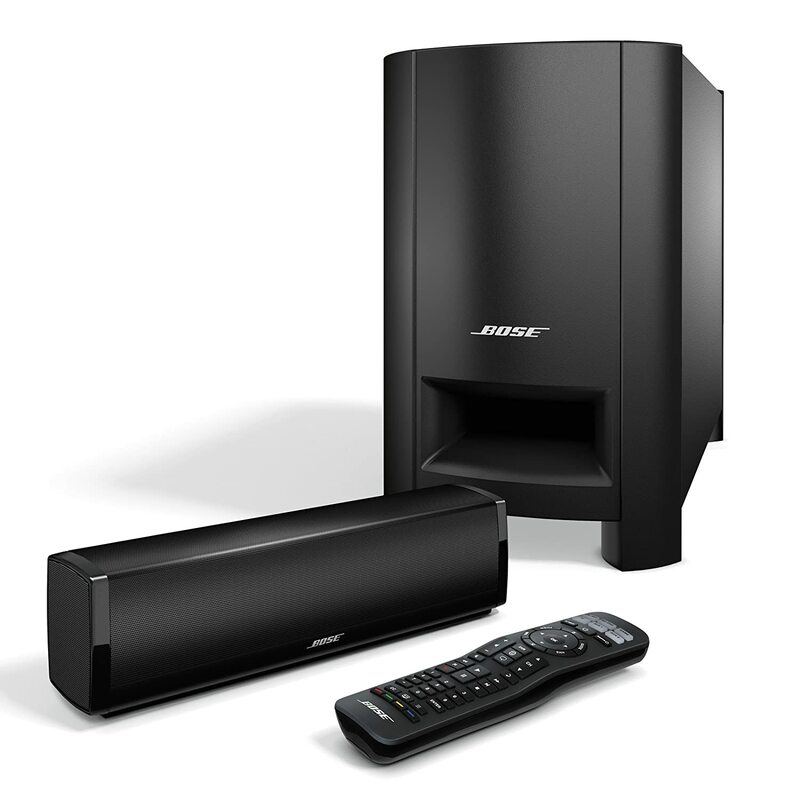 Bose Cinemate 15 system consists of 3 units: a sound bar, a subwoofer and a remote control. Three of them are designed in the master black color, bringing a very sleek, modern and elegant look. In terms of the soundbar, it is designed to come in a small, brick-shaped bar which is very flexible and easy to fit almost every space around your TV. I consider this as an advantage because of its neatness. 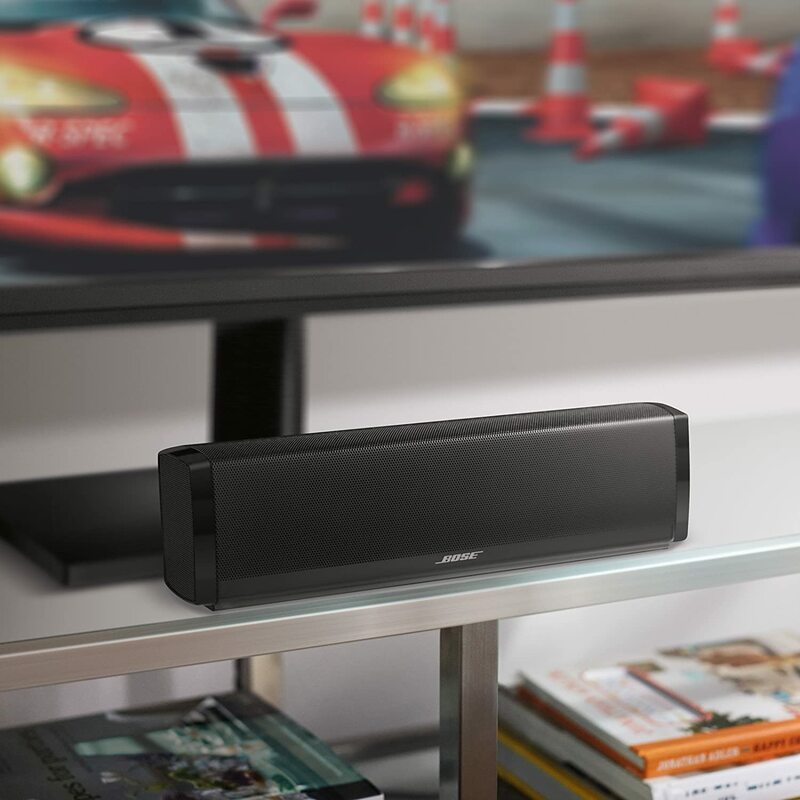 You absolutely don’t want your TV case to be littered with too many stuff, so the tiny soundbar is an ideal choice for such limited living space. When it comes to the subwoofer, the size is considerably bigger. However, this unit is still quite neat with a simple shape resembling a conventional CPU. You will need a larger site for this unit, of course, but it doesn’t involve much space, maybe only a small alley between the TV case and the wall is enough for the subwoofer. A vest whose shape is a large, rectangle hole is designed to be on the front of the unit. However, the subwoofer stands on four too high feet, which is a pretty indelicate feature, in my opinion. They seem to be unnecessary and make the whole unit chunkier instead of helping it being firmly set. The last part is the remote control which is quite big in proportion to the rest of the knit. Plenty of buttons means a lot of functions that the remote can implement. However, I don’t like the appearance much. It shares the same problem with the subwoofer’s feet – the whole look seems chunky. In summary, the design of Bose Cinemate 15 is a so-so situation which varies a lot depending on different personal views and interests. Bose Cinemate 15 is very outstanding thanks to having a range of outputs, namely the optical output, coax digital and analog connection. With many ways to connect, the loudspeaker becomes more versatile and flexible to be applied in many situations. However, according to the manufacturer, the product will perform the best when being connected via the optical output. Besides, the subwoofer with a bass adjustment knob makes it possible for me to create the sound with a proportion of bass that fits me the most. Contrary to the drawback that the big-sized remote controller brings, a plenty of button on it help a lot in controlling the loudspeaker knit. It may be a little bit confused to use from the get-go, but when I have got used to the remote, I find it extremely convenient to control everything with this unit. One thing I don’t like about this Bose Cinemate 15 is that it doesn’t have any molding feature of wall brackets for the soundbar. Even though it can be accounted as an advantage when it comes to the neatness in design, this feature limits the placement of the unit. I cannot hang it on the wall easily when I want a better sound effect or simply to save on the space. There are many merits in the sound performance of this product. The most outstanding one is the ability to project dialogues clearly over the background sound, which is a demonstrable superiority over TV loudspeaker. In addition, the sound becomes more powerful and sharper after being processed by Bose Cinemate 15 than the TV’s loudspeaker itself. The bass effect from the subwoofer is the thing that takes me by surprise because of its great deep bass sound. Consequently, a wide range of substitutions for the TV loudspeaker has appeared to solve this problem. The audiences whose wish is having a more excellent sound experience right in the comfort of their home are the targeted customers of this kind of product. However, I encounter a considerable problem with the three-second lag or so whenever there is a pause. This small disadvantage is really intrusive when it repeats quite often when I change the channel or wait for the advertisements to pass. There is a small tip to improve the sound even better – I have tried turning the subwoofer sideways on so that the vent faces the wall and this results in a fuller sound. Bose Cinemate 15 is on sale with a price of about $450. I consider that this is a cost-effective product but comes with a great sound performance. Moreover, to me, the neat design of Bose Cinemate 15 merits a lot of plus points in spite of the drawback in the subwoofer’s feet. This isn’t a perfect product without few defects. However, the advantages of Bose Cinemate 15, including a reasonable price, a great sound quality and a beautiful design, are enough to persuade undecided customers who look for a good solution to the weak sound in their TV. Now it’s your time to make your own decision. Thank you for reading our Bose Cinemate 15 Review! Bye!